When it comes to inflatable stand up paddle boards, they all seem pretty homogeneous at first glance. You’ve got the anti-slip, rubber track pad, the back fins (single or 3 fin configuration – removable or fixed), and the inflation valve. Not much room for innovation or difference there, right? Wrong. Vilano, for example, puts out various inflatable stand up paddle boards, all of which will serve your needs just fine. In the long run, though, which one is the best Vilano stand up paddle board? Which one of these inflatable stand up paddle board will give you the best bang for your buck? Well, we did quite a bit of research to try to solve this problem, and we’ve whipped up this review for you to take a look at the ins and outs of the different inflatable stand up paddle boards that Vilano has to offer. Stand up paddleboarding is definitely a bit of a commitment – You have to make sure you get the best stand up paddle board for the job, since the state of your board is the main factor that can make a day and night difference in your sup”ing cruise.Vilano inflatable stand up paddle boards are one of the most popular and the best budget-friendly inflatable SUP on the market, but you might be on the fence about them. Vilano inflatable stand up paddle boards have got a lot of things in common that help them set themselves apart from the rest in small, but important, ways. We’ve had a ton of requests to start including budget-friendly inflatable SUPs in our reviews. We have done a few. We feel we have left out some excellent inflatable SUP brands and boards, and, well, we would like to redeem that. 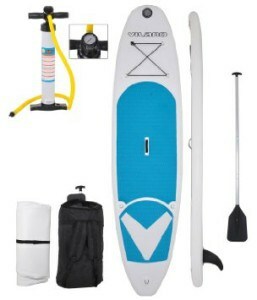 The great thing about Vilano Journey inflatable stand up paddle board is that it’s reasonably priced and it comes with everything you’ll need for a successful SUP”ing cruise. 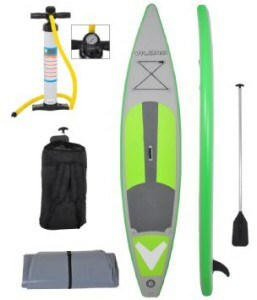 If you’re on a budget and looking for a decent inflatable stand up paddleboard that comes with a paddle, a pump and backpack carry bag, then look no further than the “Vilano Journey 10′ Paddleboard”. It’s one of the cheapest ISUP board on the market.We do think you get a lot of bang for your buck with this board. It’s really well-made,and tracks well in a variety of water conditions. On top of everything else, it’s really durable and feels like a rigid stand up paddleboard. It is made of high grade PVC material with Korean Drop-Stitch construction. Vilano Journey 10′ Paddleboard comes in two awesome colors (White/Grey – Blue/White).The board is 10′ long by 31″ wide, and it can hold up to 200 lbs.When it’s deflated, it rolls to 1 foot diameter by 35″ which makes it quite easy to carry and store.Additionally,it is equipped with heavy duty “D” ring hooks for carrying coolers or attaching Kayak seat backrest. Rigid & Durable : It feels as rigid as hard board. The Vilano Journey 10″ is made of high grade PVC material with Korean Drop-Stitch construction, it’s built to last. Ultra Portable : When deflated, the board shrinks to 1 foot in diameter by 35″. Inflated size: 10′ x 31″ Thick. Deck Features : Comfort diamond groove traction for grip and Stainless D-Rings and bungee on front deck for storage. Warranty : 1 Year manufacturers warranty that covers workmanship and material. Pump with Integrated pressure guage. Removable fin and Backpack Carry Bag. Weight Limit : 200 lbs. Vilano Navigator is the enhanced version of the “Vilano Journey”.In terms of design, they look the same.However, “Vilano Navigator” comes in different color variants,and it can hold more weight (50 lbs more). And more importantly, it sells almost for the same price as its predecessor.I mean, what’s difference does another $50 or so make over the life of your paddle board? That’s more or less the same market. So, often, it isn’t a question of whether or not Vilano Journey Inflatable SUP is good; rather, it’s more a question of why you would go for the Vilano Journey if you could a few dollars more and get something much better. As for design, apart from the color difference this is virtually identical to the Vilano Journey; to that end, choosing between these two boils down to personal preference.The choice is yours, but either one of these inflatable boards would be an awesome buy. All-in-all, this is a great option in the low-to-mid price range, and it’s ideal for beginners. The Vilano Voyager 11′ Inflatable Stand Up Paddle Board is going to be the most expensive pick of the lot by far. If you have read some of our reviews of inflatable SUP, you will know why. You truly get a solid experience with Vilano Voyager. 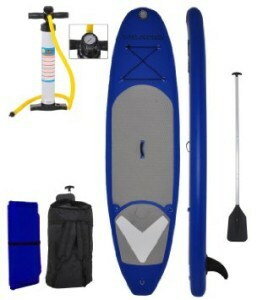 At usually just under $500, the price isn’t anything to sneeze at, but this is a very well-made inflatable stand up paddle board, and it should last you a long time. The design of this inflatable SUP Board is great as well. Ergonomically speaking,it’s really well-conceived.It has a comfortable anti-slip diamond groove deck pad. Additionally,it comes with a strong metal D ring and included bungee for toting along a cooler or dry bag, and attaching a leash or kayak seat/backrest. When deflated and rolled, the board measures 1 ft. diameter by 38 in, which makes it fit easily into the included backpack carry bag. Ultra Portable : When fully deflated, the board rolls up to a compact 38 inch long by 1 foot diameter. Warranty : 1 Year Manufacturers Warranty that covers everything from the materials used to defects in workmanship. Complete Package : Board, Pump with Integrated pressure gauge, adjustable 3-Piece Aluminum paddle, Removable fin and Backpack Carry Bag. Board weight : 24.6 lbs. Maximum weight load : It can hold up to a 300 lbs load. Stand up paddleboarding with this board is a slightly different experience. Why? Well, it’s relatively long, but it also moves decently faster than all the boards we reviewed above.The Vilano 12′ comes with a removable 8 inch center fin which allows the board to track quite well in various water conditions.That said, It is an awesome board for exploring the ocean, rivers or lakes. The board isn’t well suited for beginners, but it’s perfect for intermediate to advanced riders.Its price is quite affordable. At around $500, it’s not outrageous – and if you’re a stand up paddle boarding connoisseur, it could be a great investment. The SUP board measures 11 ft. long x 31 in. wide x 6 in. thick and weighs 24.6 lbs. When deflated and rolled, the board measures 1 ft. diameter by 38 in. and fits easily in the included backpack carry bag. The board is made with Strong PVC and Korean drop stitch construction. It comes with 7 metal D rings and bungee for on board storage. 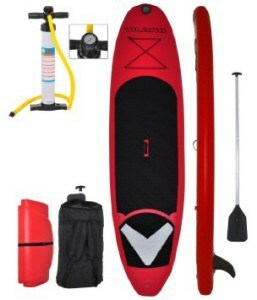 The package includes the SUP board, adjustable paddle, pump with an integrated pressure gauge, removable 8 inch center fin, patch kit/valve wrench, and backpack. The boad is backed with 1-Year Full Manufacturer’s Warranty. Max weight is 300 lbs. Vilano inflatable stand up paddle boards are very affordable.That’s part of what makes them so appealing. And with most of their boards under $600, you can get a really decent inflatable SUP board. These inflatable SUP boards are perfect for those just starting out or those who don’t want to go balls-to-the-wall and actually purchase one of those high-end SUP.